If you haven't made your way down the aisle or helped nudge a friend down one, it's easy to romanticize wedding dress shopping. Trying on beautiful gowns and getting fawned over by your nearest and dearest might be your cup of tea but in my experience, there is also dark side that includes intimidating overstuffed racks of pouf (please take no offence if you love pouf), overly opinionated staff and overcrowded change room quarters that leave you feeling hot, bothered, breathless and dress-less. Needless to say, bridal gown shopping was probably the only retail experience I didn't really enjoy so I was pretty impressed during my visit to MRS. Bridal Boutique, a new Yorkville dress shop that's a breath of fresh air. Note: the delicious cupcakes offered by Koko's Cakes did sweeten the trip just a bit. Spacious dressing rooms and a carefully curated selection of uniquely gorgeous gowns, this boutique is not for the cliche princess bride. Owners, Michelle Gunn and Kelly Power, both recently wed, understand the challenges of saying yes to the dress when you're not a cookie cutter bride and have worked hard to stock gowns and accessories that are interesting and sometimes a little irreverent, but utterly gorgeous. Appointments are required and set staggered, providing each bride and her entourage complete attention and privacy, transforming the dress shopping experience into what should be such a memorable and intimate time for the bride. Despite the posh address, the price tags aren't out of reach. Dresses from an impressive roster of designers including Elizabeth Fillmore, Nicole Miller and Francesca Miranda range $1500 - $4000 and I highly recommend a visit to the "no appointment necessary" first floor for ladies seeking interesting sparkle regardless of occasion. MRS. Bridal Boutique is located at 164 Davenport Road, just east of Avenue Road. Appointments are available Tuesday to Sunday for hip urban brides who won't settle for less than fabulous. 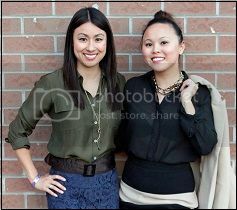 --Tamika Auwai is fashion junkie, splurge-a-holic, and founder of Shop Socials.